Having qualified for the Cup winners cup, Gor Mahia embarked on a recruitment drive to prepare for the 1987 season. In came Peter Dawo who quickly impressed fans with his energy, effort and ability to score. Back came fan favorite Charles Otieno aka 'Engine' who had left fans heart broken when he left for Kenya Breweries in 1984. Fans were elated and almost in disbilef and giddy at the prospect of seeing 'Engine' and 'Zamalek' playing in the same midfield. Also signed that year to sharpen the strike force was Anthony Odhiambo Ndolo, who joined from Kisumu All stars. Tobias Ocholla joined and imemdiately solidified the defence plugging the hole left by Swaleh Ochieng Oswayo who coincidentally had a slight resemblance to Ocholla, who was to later to earn the nickname 'Jua Kali' due to his tight marking. Anthony Ndolo was nicknamed "Suzuki" because of his speed. 1987 is considered the clubs most successful year. That year they won a unique treble : The national League , The Moi golden cup and the Africa cup winners cup which had just been named the Nelson Mandela cup. In addition the club provided 8 players to the national team which made the final of the 4th All Africa games football tournament, Kenya's most successful cup campaign yet. 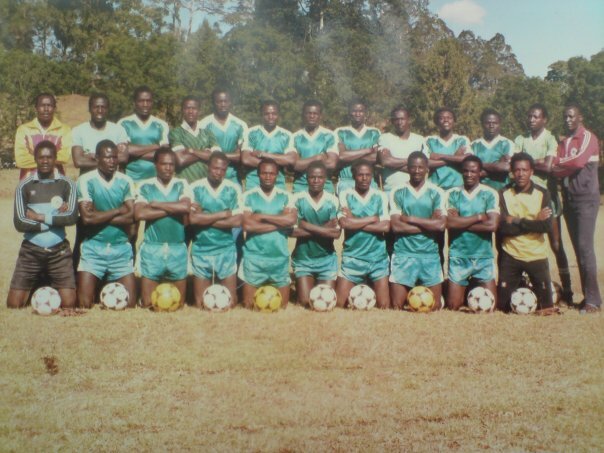 Backrow: Otieno "Bassanga", Austin Oduor "Makamu" , Peter Dawo, George Odembo Nyangi, Isaiah Omondi "Janabi", ? ?, Charles Otieno, ??, ? ?, Abbas Magongo, Tobias Ocholla, George Onyango "Fundi" , Maurice Ochieng "Sonyi"
The club was deep and experienced in all departments. There was a lot of competition among players for starting positions. In goal there was David Ochieng and Tirus Omondi , both of whom had seen action with the national team. In defence there was Isaiah Omondi , Otieno Solo, Otieno Bassanga , Bobby Ogolla , Jaffer Mwidau and captain Austin Oduor. The midfield which was deeper than the pacific featured, Abass Magongo , Charles Otieno , Okello Zangi , Onyango Fundi , Ochieng Pierre and Odembo Nyangi "artillery". In attack Anthony Ndolo , Sammy Onyango , Ben Oloo "breakdance"and prolific goal-scorer Peter Dawo completed the line-up. In addition Gor Mahia acquired the services of Dane Jack Johnson as technical advisor and Maurice Ochieng as coach. In the Cup winners cup, Kogalo started the campaign against Marine of Somalia, also known as 'Baddy'. Gor Mahia won the 1st leg 3-0 in Nairobi and the second leg 2-0 in Mogadishu with Peter Dawo scoring 4 out of 5 goals. George Onyango Fundi scored the other. In the second round they played El Merreikh of Sudan. The first leg in Omdurman ended 1-1 with a goal from Peter Dawo. The second leg was played in Kisumu's Moi stadium with Kogalo showing appreciation to their lakeside based fans who are the most fanatic and offer the club unequivocal support. The game ended in a 0-0 draw. Gor Mahia utterly outplayed Merreikh and launched raid after raid on their goal. But Sudanese keeper Hamid Breima frustrated Gor Mahia forwards with a series of incredible saves. At the time he could have been considered one of Africa's best keepers. Gor Mahia thus advanced on away goals rule. After the match Gor Mahia fans in Kisumu carried Hamid Breima shoulder high in a show of appreciation. Never had they seen such spectacular goalkeeping. In the quarter finals, Gor Mahia faced Entente Deux of Togo. The big talking Togolese arrived in Nairobi promising to "Cut Gor Mahia down to size". Those were their exact words. But it was Gor Mahia who ripped them to shreds. Sammy Onyango 'Jogoo' was in fine form scoring the first two goals, giving Kogalo a 2-0 half time lead. Captain Austin Oduor 'Makamu scored the 3rd goal with a rising shot. Peter Dawo headed home Sammy Onyango's cross for the 4th goal. Togolese striker Agunyo Kwami scored the consolation goal and the match ended 4-1 in favor of Gor Mahia. Elated Gor Mahia fans stormed the streets of Nairobi and sung songs all the way to Nation house. In the second leg in Lome, Togo, Gor Mahia kept their nerve and held the Togolese to a 0-0 draw thus advancing to the semis. In the semis they faced Dragons L'Oueme of Benin. The first leg ended 0-0 in Cotonou. As Gor Mahia fans listened intently to the proceedings on the radio, Anthony Ndolo scored a goal leading to mass celebrations only for the goal to be disallowed seconds later. 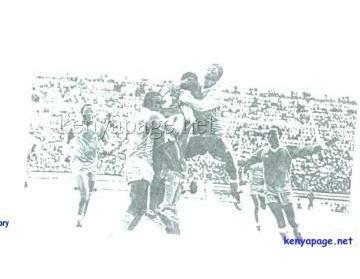 The second leg was played to a packed Nyayo stadium. In goal for the Beninois was Nigerian legendary keeper Peter Rufai who represented Nigeria at several cup of nations and at the 1994 World cup. In attendance was the then popular President Moi and his cabinet, George Onyango 'Fundi' gave Gor Mahia something to celebrate when he scored the opener after only 4 minutes with a brilliant grass cutter from 20 yards that left Rufai flat footed. But only minutes later, a Bassanga back pass was intercepted and the Beninois capitalized to equalize. Half time score was 1-1. Peter Dawo scored the second goal from a corner kick and Kogalo fans were dancing and singing in the terraces yet again. But with 15 minutes left, the Beninois equalized. Gor Mahia were now staring elimination on away goals rule. As the minutes ticked away, Gor Mahia launched raid after fruitless raid on the Dragons goal. Finally with 2 minutes left, Gor Mahia were awarded a throw in near the Dragons goal. Long throw specialist Tobias Ocholla took the throw. Up rose Peter Dawo with a back header that beat the hapless Peter Rufai in goal. Nyayo stadium turned into a near delirium as fans celebrated. So Gor Mahia were now in the final of the Africa cup. Eager they were to make amends for the disaster of 1979 when they reached the final only to be white washed by Canon Yaounde. The only players still present from that team was hard working full back George Otieno 'Solo' , Isaiah Omondi 'Janabi' and winger Sammy Onyango who was 17 year old school boy in the 1979 team. Kenyans of all walks of life joined together to wish Gor Mahia the best, whether or not they were Gor Mahia fans. In fact whether or not they were football fans, they were excited at the prospect of a Kenyan team Gor Mahia becoming the first team from East and Central Africa to lift a continental championship. They faced Esperance of Tunisia , a professional outfit at a time when all Gor Mahia players were part timers. The first leg was played in Tunis. Abass Magongo scored the first goal. Esperance equalized then went ahead 2-1. Midway through the second half. Peter Dawo scored with a brilliant long range effort. The game ended 2-2. The return leg was played at Kasarani to a capacity crowd. Esperance appalled fans by engaging in dirty tactics which included eye gouging, some of which was caught on camera. In the first half they focused on dangerman Peter Dawo, several times elbowing, gouging and stomping him. Still they could not stop him as he scored the match opener from a corner kick taken by Abass Magongo. Esperance equalized late in the second half but Gor Mahia won on away goals rule. There were wild celebrations after the match as several Gor Mahia fans stormed into the pitch to join the team in a lap of honour. 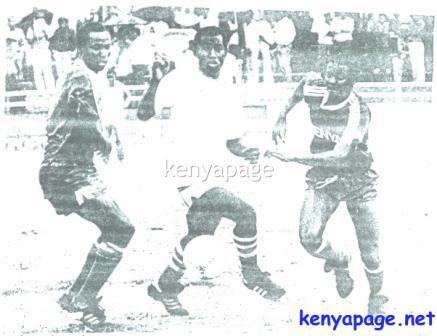 In the 1987 league, Gor Mahia were also in sensational form. On October 20, they faced arch rivals AFC Leopards who gave a really good account of themselves. It was a tough match that was decided late in the second half when Peter Dawo converted a left wing cross from substitute Ben Oloo "breakdance". Gor Mahia also won the Moi golden cup by beating AFC Leopards 2-0 in the final, thus completing a unique treble. In 1988 Gor Mahia looked to continue with the success of the previous year. They recruited new players like giant stopper Paul Ochieng 'Kunde', Ignatious Khaduli, Mike Otieno and Hezron Osuka. In addition, goalkeeper Tirus Omondi and midfielder John Okello 'Zangi' returned from suspensions. However Gor Mahia's recruitment drive could not match that of arch rivals AFC Leopards who were desperate to match Gor Mahia's feat of winning the Africa cup. With the financial muscle of Alfred Sambu, Leopards raided Volcano United and Re-Union and poached national team players like Hassan Juma and Davis Oyiela. Gor Mahia passed up the opportunity to play in the CECAFA cup due to fatigue. Their place was taken by Kenya Breweries who had finished 3rd in the league. Brewries ended up winning the CECAFA cup that year thus underlining the strength of Kenyan clubs in the region. Impressive amongst the Gor Mahia new signings was stopper Paul Ochieng. Since the retirement of the legendary John "Bobby" Ogolla in mid 1987, Gor Mahia had lucked a true rock solid stopper. 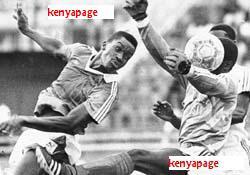 Even as they won the Africa cup in 1987, the role was played by Peter Otieno Bassanga was really a full back. Ochieng was tall, strong and built like a tank. He was unbeatable both in the air and on the ground. Mike Otieno was only 18 when he joined the club straight out of Musingu high school. The stocky left footed winger was explosive and had an incredible acceleration which he used to whizz past defenders. A product of Musingu Secondary, He was also an excellent crosser of the ball with either foot. Mike's talent however was never fulfilled due to his lack of focus and his "party animal" nature which led him to miss practice often. John Okello "Zangi" (left) seen here playing for the national team. He thrilled fans with his quick feet and ability to slice through and set up strikers. 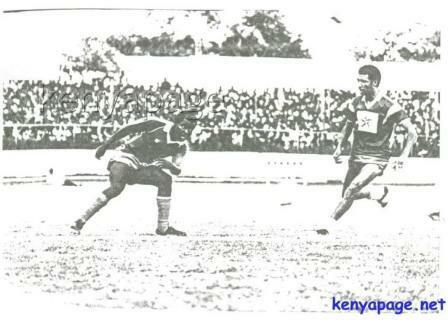 In 1988 Gor Mahia lost the league title to a resurgent AFC Leopards. They however retained the Moi golden cup by beating Kenya Breweries in the final. In April of 1988, Gor Mahia provided an incredible 10 players to the national team that played in the 1988 Africa Nations cup. The 10 were goalkeeper David Ochieng, defenders Tobias Ocholla and Austin Oduor, midfielders Charles Otieno, John Okello 'Zangi', George Onyango 'Fundi', George Odembo 'Artillery' and strikers Peter Dawo, Sammy Onyango and Anthony Ndolo. Midfielder Abass Magongo was also in the national team but was dropped after he was accused by coach Chris Makokha and team manager Joe Kadenge of causing disharmony amongst players. So out went a player considered by most to be Kenya's best, much to the chagrin of Kenyan fans. So Gor Mahia set out to defend the Africa cup title they had won the previous season. In round 1 they beat Mukura Victory 1-0 at home and 1-0 away. In the second round they faced BTM of Madagascar. The local papers were replete with stories about how Gor Mahia full backs would have difficulty dealing with the fleet footed Madagascan wingers who supposedly could run the 100m in less than 10 seconds. Indeed Tobias Ocholla, a good a marker as he was might have had difficulty with that speed. So in stepped Isaiah Omondi 'Janabi' at right full back. He did an excellent job of staying toe to toe with the Madagascan defenders. Sammy Onyango scored the 1st goal. However the Madagascans equalized when yet another back pass from Bassanga went astray. George Odembo Nyangi scored the second goal with one of his trade mark missiles from long range. So Kogalo took a slim 2-1 lead to Madagascar made worse by the away goal they had conceded. Gor Mahia played a cautious game in the return leg in Madagascar. As the much seemed destined for a goalless draw, George Odembo Nyangi scored the lone goal in the last 5 minutes to give Gor Mahia a 1-0 victory. Madagascans from that era probably wont ever forget Nyangi. Not only did he score twice against BTM, but hios cracker of a freekick had sunk the Madagascan national team a year earlier. In the quarter final, Gor Mahia faced Inter Club of Congo-Brazza. They embarked on residential training in Nyahururu. Large crowds of locals showed up at each training session to watch Kogalo practising. Bad news reached the club when it was announced that inspirational midfielder Charles Otieno could not join camp due to job commitments. To make matters worse, playmaker Abass Magongo left camp to attend the funeral of his mother who had just passed on. Only a month earlier, John Okello "Zangi" had been expelled from the club by new chairman Douglas Oyieng Odolla much to the chagrin of fans who liked Zangi. Odolla's reasons for expelling Zangi were flimsy but such is the nature of Kenyan club officials. So in short order Gor Mahia had lost 3 key midfielders. In the 1st leg, Gor Mahia won 2-1. Hezron Osuka scored the 1st goal. Inter Club equalized midway through the second half. As the match waned, substitue Mike Otieno made one of his trademark explosive runs down the left flank and crossed to Peter Dawo who headed home for the second goal. In the second leg , Gor Mahia visited Brazzaville and were shabbily treated by their hosts even to the point of being denied training facilities. An appeal to CAF was not listened to. Gor Mahia lost the second leg 4-1 having been demoralized by their hosts. However as we know then like now CAF often applies selective justice. Arch rivals AFC Leopards suffered at the hands of blatantly biased officiating when they faced Diamant of Cameroun at the same stage. In the local league, Gor Mahia finished second to AFC Leopards for the second season in a row. 1989 saw the beginning of the decline of the club. Despite making it to the semi-finals of the Cup winners cup it was apparent that the standards of the once mighty club were falling. They lost the Moi golden cup and once again finished second to AFC leopards in the national league. Coach Jack Johnson left in a huff and the club began to experience financial difficulties. On the continental scene the club was left behind by several African teams which were gradually transforming into fully professional units. 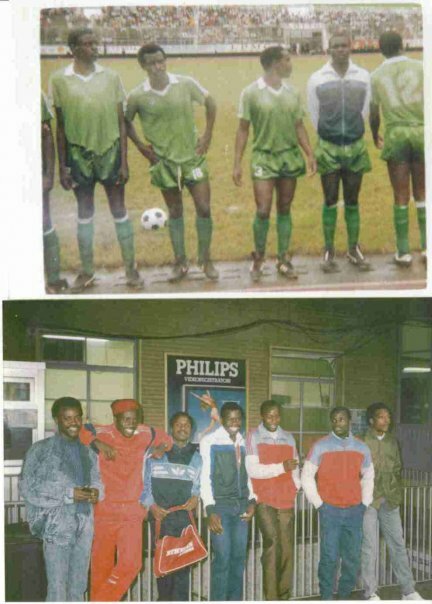 The picture below is of Kogalo players in Paris France in 1987. From left to right Abbas Magongo "Zamalek", Austin Makamu "Oduor", Peter Ochieng "Pierre", Charles Otieno known as "the engine", Isaiah Omondi "Janabi", Sammy Onyango "Jogoo" and George Onyango "Fundi"
In 1989 Kogalo retained the Moi golden cup for the 3rd succesive year by beating Kenya Breweries 2-0 in the final. After the match, Abass Magongo who was man of the match was carried shoulder high by fans. Gor Mahia however lost the league title to a resurgent AFC Leopards who benefited from their recruiting spree and sponsorship from Crown Paints. Having won the Moi Golden cup the previous year, Gor Mahia were back in the cup winners cup in 1989. In the 1st round they received a walk over when Villa of Uganda pulled out. In round 2 they beat Costa Do Sol of Mozambique 2-1 at home and tied them 0-0 away. In the quarter finals they faced LPRC Oilers of Liberia. 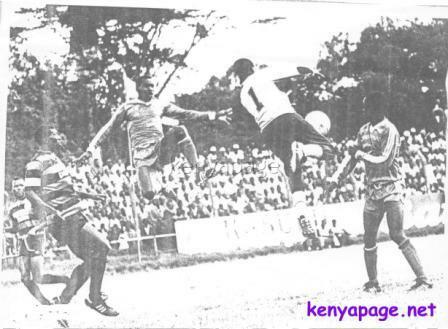 The 1st leg was played at Nyayo stadium. Gor Mahia played a disjointed game and the game ended 0-0. By this time , Danish Coach Jack Johnson had left the club due to non-payment of his salary. After the match, Liberian players celebrated as if they had won a cup final. Gor Mahia team manager told the media that Kogalo would conquer the return leg. Indeed they did, winning 3-1 in Monrovia. Coach Mohammed Kheri had been drafted from Bandari on a temporary basis to replace Johnson. In the semis they faced El Merreikh of Sudan. After winning the 1st leg 1-0, they lost 0-2 in the return leg in Omdurman. So Gor Mahia bowed out in the semi final.